If you come in here, Halfway , if you sit at the table of Nordine Labiadh and Virginie, if you are not afraid of mixtures of Franco-Tunisian flavors without forgetting a little tour by Brittany, meetings, Beautiful people; If you have the taste of elsewhere, the desire to travel your taste buds between Paris and Tunis, to soak your lips in natural wines; If you want equality, diversity, generosity; If you want to try the chef's recipes with his book Paris-Tunis; If you are ready for this experience then you will leave conquered on your way and fill in new friends. 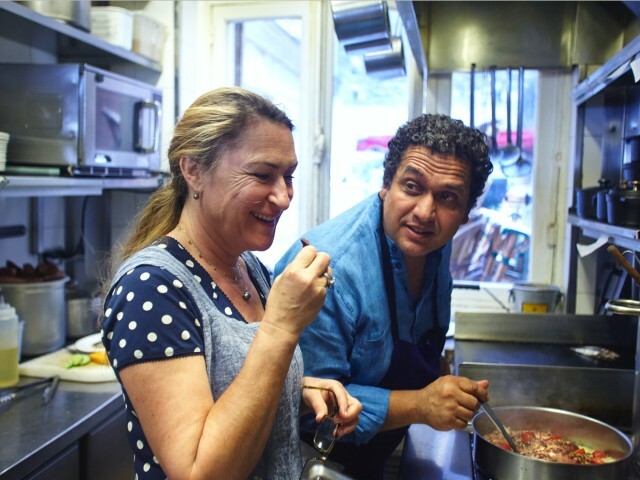 Virginie and Nordine share their differences both in the plate and in their lives. Their restaurant Halfway to 31 rue Boulard 75014 Paris is open from Tuesday to Saturday. A stone's throw from the entrance to the Catacombs of Paris and the Cartier Foundation for Contemporary Art, Denfert-Rochereau metro.